Cubs got to enjoy one of the many joys of being part of the Broken Bay Scout Group – a camp fire cooking evening! To Cubs cooking their choice of veggie and sausage in two troughs of coals for those working towards their Silver and Gold Boomerang badge work. I’m sure all Cubs would give the experience a massive thumbs up! A big thank you to our wonderful leaders and parents! Cubs Cooking up a Storm! About 24 Cubs enjoyed a wonderful couple of days cooking up a storm over the 2nd and 3rd April. The best news is parents got to sample these cooked treats too but more about that shortly.. Broken Bay Cubs were joined by 3 Cubs from the 1st Narara Scout Group for this culinary activity. Nicely rounded off by Nutella Smores (dessert) – leaving the parents replete and happy. A big THANK YOU to Akela and Jacala (Broken Bay Scout Group) for making this all happen, Bagheera (1st Narara Scout Group) and all the parent helpers! New Roof for our Umina Hall! Is everyone blown away by the beauty of the new roof for our Umina Beach Joey/Cub Hall? It even comes complete with whirly birds. I would like to deliver a heartfelt thank you to everyone involved with the new roof with a special thanks to Kotic and the roof workers Craig, Camo, Jake and Dicko who made it all happen! Thank you Anthony for the twilight shot. Cubs had a great night watching the Pearl Beach Rural Fire Service put out a simulated fire in our fire pit, learnt about fire safety, and got to spray the hose and sit in the fire truck. Thanks Pearl Beach Rural Fire Service! Thanks John for organising! Halloween party games and party food = FUN! Cubs had loads of spooky fun at its Halloween night! 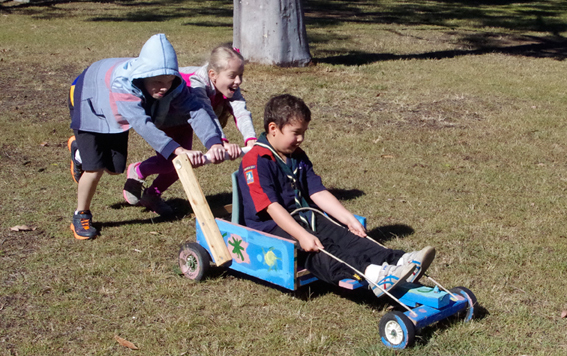 More fun is planned for Cubs and their families at the Gosford District Cub Billy Cart Derby, Poms Camp, Jilliby. The fun kicks off at 10am. Cubs will be racing billy carts down a slight slope in age groups. They will be pushed by another cub. Following a sausage sizzle lunch we will be running the Gosford District bases from Cuboree. Giant water slide, water pistol laser tag, sock wrestling, sponge volley ball and our loom band base. Siblings may participate in these activities. Many thanks to Hunter & Coastal region for allowing this. Directions: Poms Camp is on Brothers Road, Jilliby. From freeway exit at Wyong Rd, (away from Tuggerah) follow Old Maitland Rd to Alison Rd, turn right towards Wyong and then turn left into Old Maitland Rd. Turn left onto Hue Hue Road then left on to Jilliby Road. Left again onto Little Jilliby Road, Brothers Road is off this on left. A small side road/ally runs off this to Scout field on right. You will see about a half acre of cleared land and a shed, with lots of bush behind. Cub Scouts have lots of fun doing a lot of interesting things! There are games to play, codes and skills to learn and new friends to meet. Cub Scouts all help each other, and try to help other people too. Each week you’ll get together with other boys and girls your age and be led into adventure! You’ll wear your own Cub Scout uniform to show you’re one of us. Plus you’ll be able to collect special badges to put on your uniform to show your achievements. At your first pack meeting you may feel a bit shy to begin with but it won’t take long to get to know everyone. You’ll learn the Scout Salute, the Handshake, the Motto, the Grand Howl, Pack Calls, the Cub Scout Law and the Cub Scout Promise. The leaders will help you. You’ll soon be making friends with Cub Scouts and having a terrific time! You’ll find there are around 24 boys and girls in your Cub Scout Pack. All of them are just like you. They all might have different interests and be good at different things, but they all want to enjoy themselves and have fun. We spend weekends away together camping, fishing and exploring. We go to the Fire Station, visit factories, go the zoo, go to the local museum and local Heritage sites. We learn bushcraft, and we learn how to fly model aeroplanes and make matchbox sailing boats. There’s a lot more Cubs Scouts do too. Why not come along and find out? Your leader is known as ‘Akela’ (the Wolf – the one who stands alone). Akela’s other current helper is Jacala (The Crocodile). The names are taken from the famous Rudyard Kipling story “The Jungle Book”.